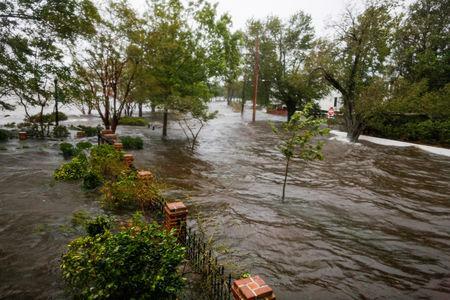 WILMINGTON, N.C. (Reuters) - Tropical Storm Florence trudged inland on Saturday, flooding rivers and towns, toppling trees and cutting power to nearly a million homes and businesses as it dumped huge amounts of rain on North and South Carolina, where five people have died. "This storm is relentless and excruciating," North Carolina Governor Roy Cooper told CNN late on Friday. "There is probably not a county or a person that will not be affected in some way by this very massive and violent storm." On Thursday, Florence was a Category 3 hurricane on the five-step Saffir-Simpson scale with 120-mph winds (193 km). It was downgraded to Category 1 before coming ashore on Friday near Wrightsville Beach close to Wilmington, North Carolina. The hurricane center downgraded Florence to a tropical storm later in the day. A mother and baby were killed when a tree fell on their home in Wilmington. The child's injured father was hospitalized. In Pender County, a woman died of a heart attack. Paramedics trying to reach her were blocked by debris. New Bern's mayor told CNN that 4,200 homes were damaged in the city. Eudy said his family stayed in their home partly to protect their house. "And we had no belief it would be as significant an event as it was," he said. "This is a 500- or 1,000-year event." More than 22,600 people in North Carolina were housed in 150 shelters statewide, including schools, churches and Wake Forest University's basketball arena. In South Carolina there were 7,000 people staying in shelters, according to the state's emergency management office.